Lead an ancient Japanese clan in search of revenge against a fearsome demon in this beautiful watercolor RPG. Unite with gods inspired by Japanese mythology to ensure each new generation is more powerful than the last. Choose from 8 unique classes for the warriors of your clan, including Fencer, Martial Artist and Gunner. Use the PS Vita’s camera to take a picture of yourself and create a clan leader modeled after your own appearance who spawns generations of warriors throughout your quest. Interact with your friends' in-game lands to buy exotic items and encounter rare gods to aid you in your adventure. Add a little feudal Japanese flair to your PS Vita by downloading these pre-sized wallpapers. Enjoy your new Oreshika-themed backgrounds! 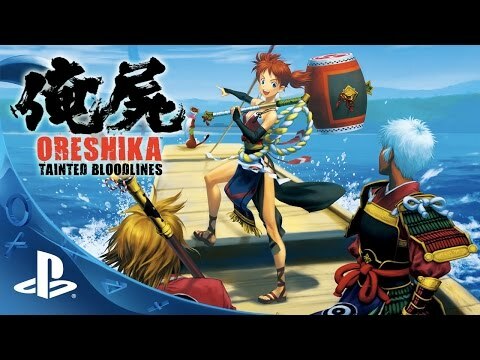 ©2015 Sony Computer Entertainment Inc. Oreshika and Oreshika Tainted Bloodlines are trademarks of Sony Computer Entertainment America LLC.